The wasteland of Fallout may be impressive in terms of scale and detail, but I always feel a bit lonely in it. Defiance is such a world, but it’s one constantly shared with other players. At any time, your clan may show up and help out on a mission or you may come across a 100+ player competitive match in the middle of a map. Defiance is an MMO but it’s one unlike any other, though it suffers from some familiar problems in its current state. Defiance isn’t based on a TV series, it’s part of one. Launching two weeks before the premiere of Syfy’s most expensive production yet, Trion Worlds (Rift, End of Nations) is introducing players to the world of Defiance. In time, the TV series will introduce elements to players, such as hell bug invasions and deadly storms that start in the TV show’s St. Louis setting and slowly make their way to San Francisco, where the game takes place. This creates an interesting dynamic between the two mediums that binds the story of each together. There are also narrative ties that give background information on events and characters in the show, connecting the gaps between episodes and -- if all goes as planned -- seasons. Before I knew of the TV angle, I became familiar with the game from people comparing it to Borderlands. The shoe certainly fits. You’ll traverse a wasteland, shoot random bandits, and collect loot/xp. What’s wrong with that? A Borderlands MMO sounds pretty good to me! 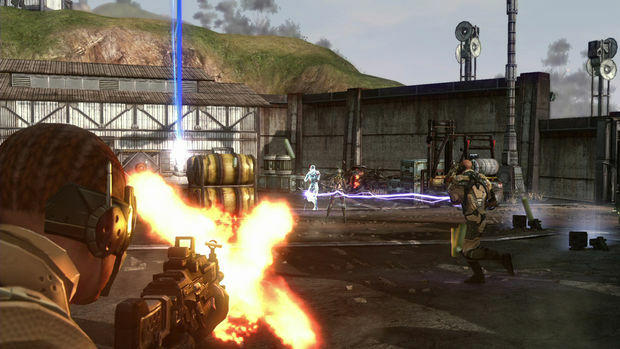 Defiance can become pretty hectic as players join up for a mission. Main missions are shared experiences where any player can fulfill objectives for all, while side missions require each player to act. The game balances player count by adding tougher “Elite” enemies and increasing other enemies’ health. The demo felt rather easy but that may have been because I was early in the game. Playing with 15 or so people in a multiplayer match felt great, as did five or so joining me randomly for a mission. Trion is hesitant to talk player count because it’s a sensitive issue that affects not only the server tech but all aspects of the game’s design. I found the spontaneous chaos of players exciting but if that number goes into the triple-digits it could become maddening. Trion is trying to figure out the player count for each space, so players don’t lose sight of what the game’s story and mission objectives. I have mixed feelings about this, mostly because I endorse 400+ player virtual orgies. If it breaks the game, we can at least have a good time doing it! Shooting, throwing grenades, and running feels pretty standard for a third-person shooter but game-changing for an MMO. It's always fun to shoot things, especially in the context of an MMO. Like Borderlands, you’ll acquire tons of weapons and loot that modifies your shield, grenades, and other equipment. There are also active and passive abilities to unlock. The demo I played featured cloaking, rage, sprint, and decoy abilities -- some made more sense in a competitive setting than others. Another key aspect are vehicles which you can summon with the touch of a button at any time. 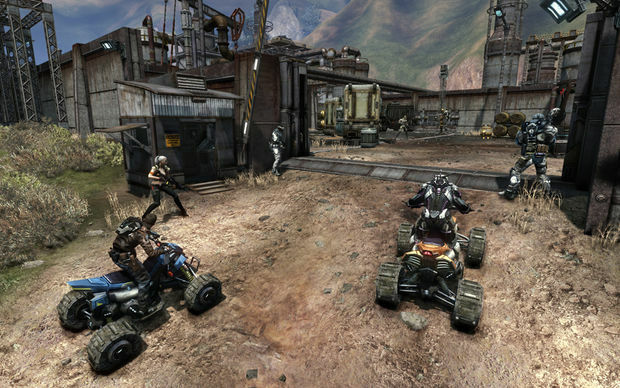 More vehicles will be earned and unlocked over the course of the game, making the large landscapes of an MMO a playground instead of an obstacle. For the first time, Trion showed off its Shadow War multiplayer mode that creates a “Capture the Nodes”-type game in the middle of an area. At any time, other players can observe, join, or ignore these matches. They can be a stupendous spectacle or a quick distraction, depending if you add the match to your queue or not. There are also arena-based matches, but Shadow War seems like a much more original idea. It’s pretty hilarious to be in an intense firefight while some other clan drives by on their ATVs, rushing to the next story mission. One area that Defiance doesn’t shine is in visuals. Though Trion didn’t show off much of the game’s world, what I was shown is decidedly darker and lamer than what I saw on the set of the television series. The fiction is a rich one that pulls from a lot of history and culture, but the game area and missions shown looked as generic as can be. This is Borderlands before the iconic cel-shading art direction was applied. Defiance is rough around the edges and a bit ugly and, with six months until launch, Trion face a challenge in getting it on par with the TV series. 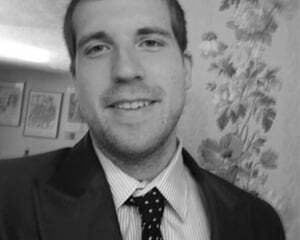 On the other hand, the game is fun -- something I don’t often (ever?) say about MMO games. The shooting, player dynamic, innovative interaction with the TV series, and RPG elements make for a unique MMO that I’m willing to give a shot when it releases in April. I just hope that the game manages to capture some of the detail, color, and personality of the TV show.